The Deepwater Horizon oil spill happened in the Gulf of Mexico nearly three years ago, but the estimated 4.9 million barrels of oil that it released are still killing dolphins, sea turtles and other marine life in record numbers, according to new research. 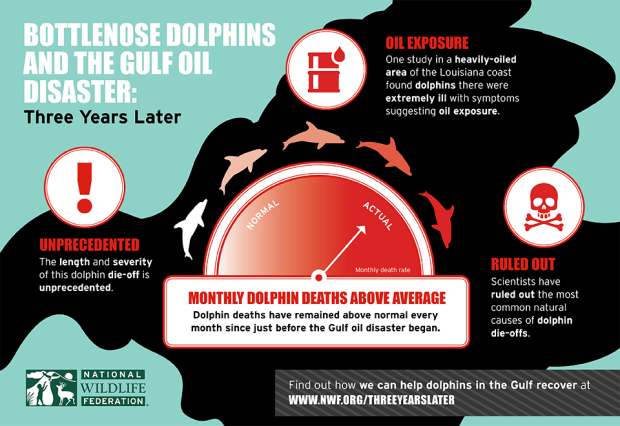 The report, “Restoring a Degraded Gulf of Mexico: Wildlife and Wetlands Three Years into the Gulf Oil Disaster,” found that dolphins were among the hardest hit animals. As of just earlier this year, infant dolphins were dying six times faster than they did before the spill. Scientists aren’t even yet sure of the extent of the massive spill, given that it was impossible to fully clean up the chemical-laden, carcinogenic oil. The National Oceanic and Atmospheric Administration (NOAA) called the dolphin die-off “unprecedented” a year ago. More than 1,700 sea turtles were found stranded between May 2010 and November 2012 — the last date for which information is available. For comparison, on average about 240 sea turtles are stranded annually. A coral colony seven miles from the wellhead was badly damaged by oil. A recent laboratory study found that a mixture of oil and dispersant affected the ability of some coral species to build new parts of a reef. Scientists found that the oil disaster affected the cellular function of the killifish, a common baitfish at the base of the food web. A recent laboratory study found that oil exposure can also harm the development of larger fish such as mahi mahi. The BP spill is one of the most dramatic and damaging reminders in recent history of one of the major external costs (pollution) attached to reliance on oil, and we’ve seen plenty of indications that dolphins are paying a price. I don’t think you can ever create a system of production and use that would eliminate pollution (or health costs; and greenhouse warming is permanently embedded in oil use). But if you price oil to include these costs you can reduce the amount of oil we use, and reduce the external costs. Yes, there is a gas tax to help pay for roads and highways, but that tax doesn’t even pretend to help cover health and pollution costs. And a carbon tax would need to be perhaps $80 a ton (which would add about 80 cents to a gallon of gas) to really start addressing the impact of oil and carbon on the climate.